No, I didn’t go on a picnic…rather, I want to picnic SO BAD. But it’s been rainy for the past 320443214 days (approximately), except for yesterday. Yesterday was gorgeous, but I spent it at work. I figured if the rapture was coming, I’d best look busy. But! I want to picnic. I want to spread this blanket at the new Race Street Pier or at the Mann Center and pack a meal like this one to snack on and enjoy the spring weather before the humidity kicks in. I’m going to make this happen. May 22, 2011. Uncategorized. Leave a comment. 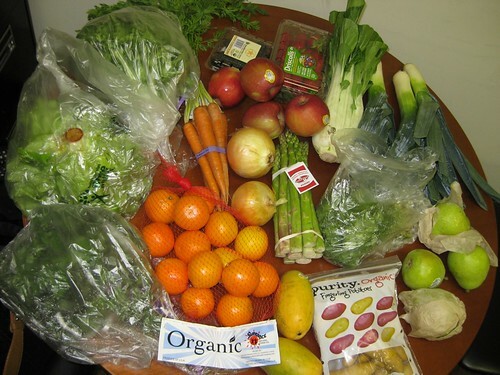 I think I’ve mentioned this before, but I’ve been splitting a large box of organic fruits and veggies from Panache Food with Dr. Lindsay and Professor Jordan (Jordan, you might become The Professor) for a few months now. It’s great. The above picture is an example of what we get every two weeks. But that’s not what this post is about! Well, kind of. We’re due for a delivery tomorrow, so I didn’t want to go out and buy a bunch of food for dinner tonight. Instead, I made due with what I had. Which included a can of salmon, a few cherry tomatoes, a head of romaine, and the dregs of jars of olives, capers and pickled peppers. 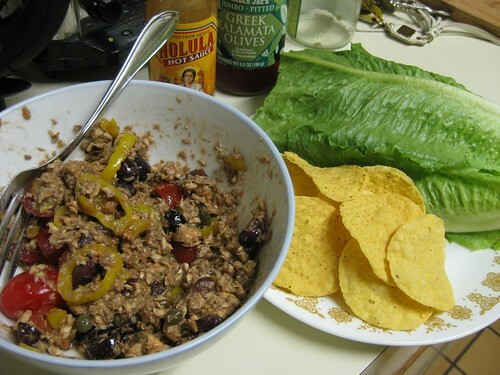 The lot was tossed with some olive oil and balsamic vinager and eaten wrapped up in the romaine and scooped up with chips. 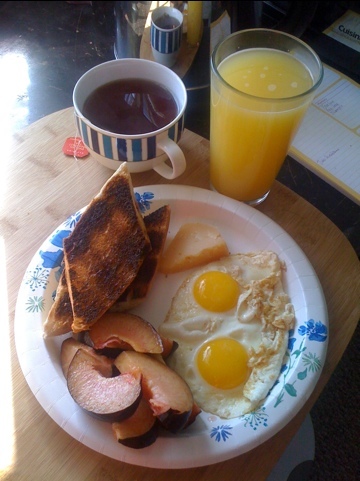 No, not the prettiest dinner, but delicious! April 20, 2011. Uncategorized. Leave a comment. I seem to have stumbled onto a hobby. You see, it started with my first French press coffee experience. I think it was at Chez Colette, the French restaurant that used to be in the Sofitel. I came home from brunch with Candace and told my dad about the delicious coffee and how they served it. Thus began my coffee making education. I used the French press throughout law school whenever I had a leisurely morning*** and occasionally watched my dad make Greek coffee in a Turkish pot. The next step came with the purchase of my first Moka pot, which reminded me of the coffee my Nana would brew in her percolator. 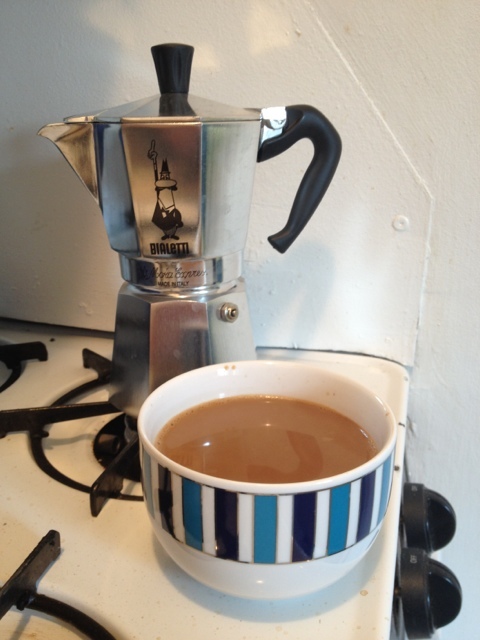 While in Italy, I spied a stovetop espresso maker, kind of like this, that came with a little red cup. I used it to ease myself back into a life that lacked a smiling waiter bringing me a steaming cappuccino every morning. But the stovetop contraptions just don’t work the same without a gas stove – the heat distribution on an electric range isn’t ideal for the smaller footprint. To soothe some of my electric stove woes, I’ve turned to this ceramic filter holder with a mesh filter. So civilized. 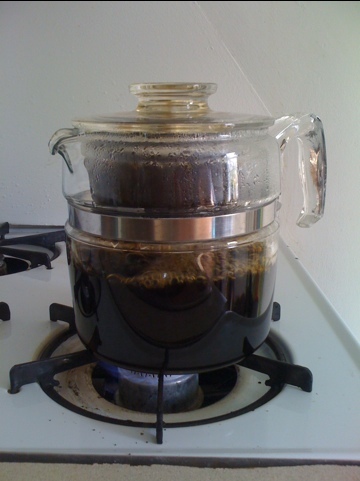 I add two scoops of coffee to the filter in the holder, then once the water boils, add about a cup and a half in three steps, to allow the grounds to bloom and do whatever it is they need to do. So that’s my hobby – a growing collection of coffee contraptions, all of which require different levels of grinding for optimal deliciousness. 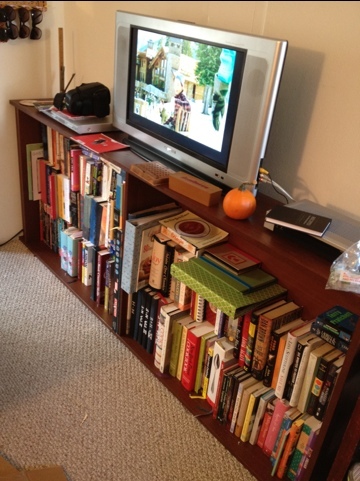 And that, dear readers, is where you come in. I had bought a tin of pre-ground Illy coffee (on sale at Kitchen Kapers, woo! ), but that’s now kaput. My plan is to keep whole beans on hand (well, in the freezer) and just grind a bit at a time. I know a burr grinder is probably my best bet, and I definitely want one that has different grind settings. But which one? Go, Internet hive mind, go! * Forgive the artistic license, as my dad has probably never used “totally” in such a way. ** Everything is in the basement, including, as I discovered after breaking the first French press pot, a back-up French press pot. 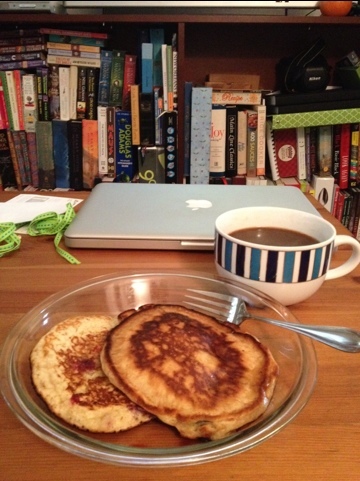 *** Oh, how I miss those mornings. April 18, 2011. Uncategorized. 2 comments. And if you don’t know what that is (it’s a TARDIS), please go look at this page and then come back. It’s not quite evident from the picture, but this isn’t just any old TARDIS. Oh, no. 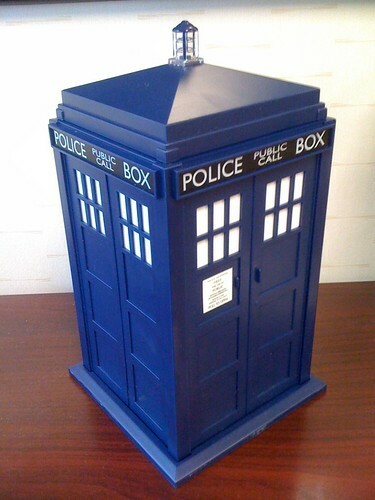 It’s a cookie jar SHAPED like a TARDIS. Furthermore, when you open the lid and subsequently close it, it makes the oh so distinctive “vworp vworp” noise that the TARDIS makes. Anyway. Linda and John gave me said cookie jar with one caveat. That I keep it filled with cookies. 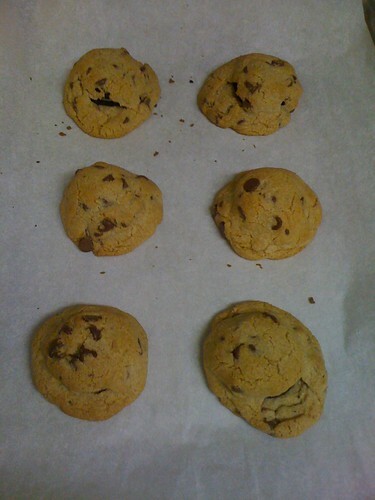 Fast forward to last week, when Linda challenged me to make these cookies. No, you’re not reading that incorrectly. Oreo Stuffed Chocolate Chip Cookies. Chocolate chip cookies stuffed with Oreo cookies. When I worked for the funnel cake stand, we didn’t just sell funnel cakes topped with powdered sugar. Oh no. We also sold funnel cakes with a variety of toppings (fruit, candy, syrups) AND fried Oreos. The way we described it was an Oreo cookie, dipped in funnel cake batter and fried. The process made the cookies really soft, like a devil’s food cake. While my funnel cake eating days are over (I will never unsmell what 100s of funnel cakes smell like), I’d have no problem eating a fried Oreo. I figured that’s what this would taste like. It’s difficult to give you an idea of the size of these, but keep in mind there’s a full Oreo cookie in each. And the amount of cookie dough is roughly double what I would normally make for one cookie, because the dough has to wrap around the Oreo. 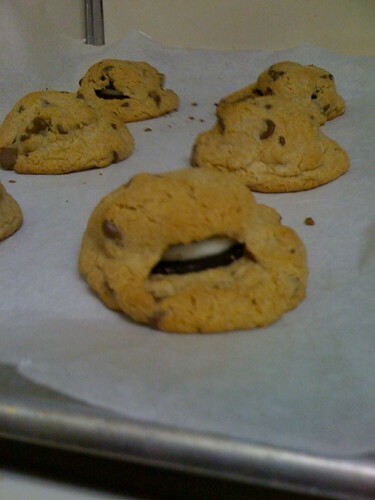 This is what happens when you don’t seal the cookie dough around the Oreo – gaps! And here are the innards. Linda and John will get to taste them tomorrow when I fill up the TARDIS, but I had to have one tonight. Quality control, you know. I split one with roommate Gabe and that was quite enough. 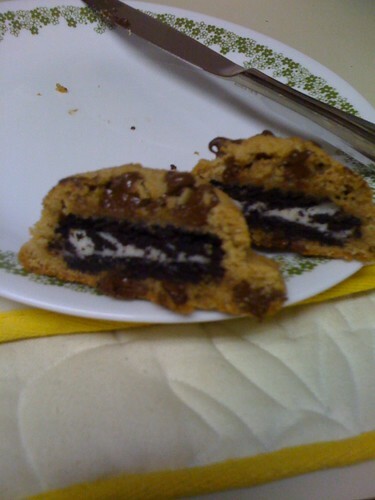 I think if I make these again, I’d omit some of the sugar from the cookie dough – these are ridiculously sweet. 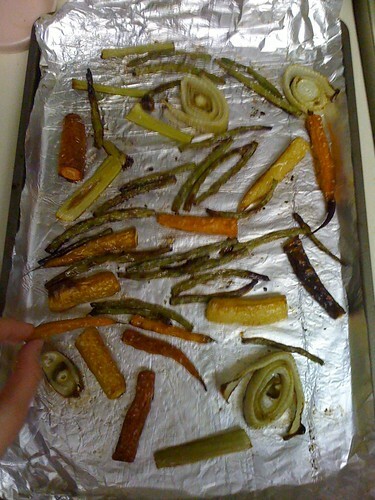 Roasted organic veggies from my share of the box I split with Jordan and Dr. Lindsay (who matched to her first choice for residency because she’s awesome). 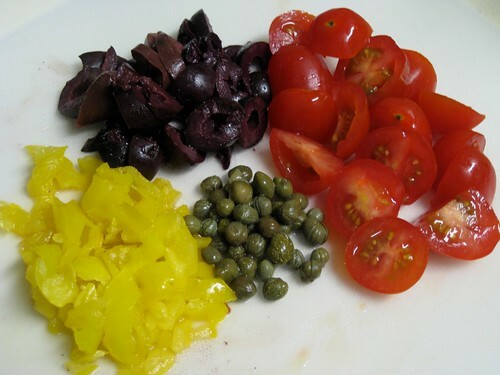 There are multi-hued carrots, fennel, and green beans tossed with olive oil and sprinkled with salt. And now for some mint tea and Big Night. Va bene. Va molto bene. March 27, 2011. Uncategorized. Leave a comment.